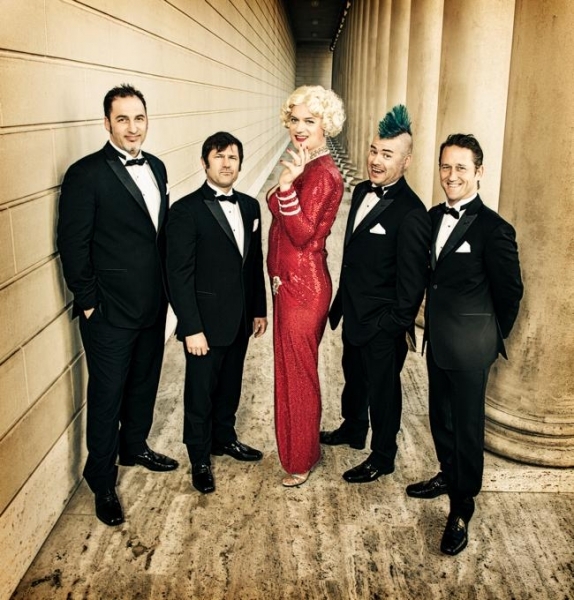 When Me First and The Gimme Gimmes formed nearly two decades ago no one expected them to last this long. The group, a punk rock cover band featuring members of NOFX, Lagwagon, and The Foo Fighters, started because a bunch of friends enjoyed playing with each other, and because, beyond anything else, it was fun. If there is anything The Gimmes have been able to retain over their tenure as the undisputed kings of cover acts, it's their sense of fun. Recently Scene Point Blank had the opportunity to sit down with Gimmes guitarist and Lagwagon front man Joey Cape to chat about the band's most recent studio album. Scene Point Blank: It's been a couple of years since we've seen a new Gimmes album. Was the gap between releases just a bi-product of how busy everyone is or was there a conscious decision to take a bit of a break? Joey Cape: Both are true. Everyone is busy doing other things and the cover band is hardly their priority. I imagine most members of bands need time away from each other and the breaks, in every sense of the word, are honored well in this band. We do not get together all that much, and when we do, we have it easy. Haha. Scene Point Blank: I know everyone involved with the group are good friends, but how has playing together again been after such a long hiatus? Joey Cape: We still see each other at weddings and funerals and occasionally at pubs or parties. We still did some occasional touring over the years between records. It did not feel like a huge hiatus to me but it’s amazing how fast the years fly by. Scene Point Blank: It was only when putting together questions for this interview that I realized the band has been together for well over a decade. Did you ever expect it to go that long? Joey Cape: We started the band in 1996. I didn’t expect it to outlast that year, haha. It was just meant to be a band to play pubs for our friends, then we decided to do a few 7-inches. Then we made a full-length from 7” A-sides. After that we started touring occasionally. It still makes me laugh when I consider that it is a cover band. Scene Point Blank: What would you attribute the longevity to? Joey Cape: I suppose people enjoy the songs. They are all hits. Haha. Scene Point Blank: So many of the bands you and the other members have played in were really vital in shaping what punk rock is to me, but at this stage of the game there are fans who may know The Gimmes and may not know the others bands you've played in. Is that strange for you? Joey Cape: Yes, but it is part of the deal when you are playing something more accessible. I don’t even consider The Gimmes as actual art. It’s purely entertainment and, by the looks of what people want from music, this is not all that surprising. That said, I think we are a good cover band and I would like it myself had I never been involved and had just caught a listen. It’s fun if you like good melody and were a pop music fan growing up. It’s a guilty pleasure. "We come from San Francisco. I don’t think gender roles are all that odd or funny. I do enjoy the fact that these subjects make some people a bit uncomfortable." Scene Point Blank: I could be wrong in this, but I never feel like the covers The Gimmes do are being done sarcastically. There always seems to be some genuine love of the track. Do you feel as though you're taking the piss with the songs you choose or is there something you like about each of them? Joey Cape: For the most part we are united in the love for those songs. I think most of them are great songs and all we do is format them so someone else can get past the cheese and hear the core melody and arrangement. There are a few cases, though, where the song is simply butchered or in jest. That goes with the territory. Scene Point Blank: How do you make a song that's not yours feel like your own? Joey Cape: Punk rock arrangement and Spike on vocals. Scene Point Blank: The latest album deals with tracks that are all traditionally sung by women. Is playing around with the gender roles something the band was interested in exploring artistically or was it just an easy theme for this release? Joey Cape: Well, it isn’t anything new. We did this on our second record, the showtunes record Are A Drag. We come from San Francisco. I don’t think gender roles are all that odd or funny. We once played the Folsom Street gay pride fair in drag. It was awesome. Well, maybe that was a little funny. I do enjoy the fact that these subjects make some people a bit uncomfortable. Dressing up in any outfit, whether it feels natural or like costume is a good time. Of course, Spike got all the pleasure on this one. We were simply in the role of suitors. Scene Point Blank: Does playing others people's songs take some of the pressure off of you artistically because they're not your tracks? Or do you feel as though you've got to give that person’s work justice? Joey Cape: Yes and yes. Scene Point Blank: You played on an early version of the Revival Tour, is there any chance we could see you out there with Chuck and the gang again soon? Joey Cape: I would love to do it again someday but I have done many acoustic tours like that since. The Revival Tour and Chuck are really great but the songwriter in the round is something that all of us do on those sorts of tours. Chuck does it very well though. He has branded a name and he has a well-oiled machine on the road. It’s very cool. Scene Point Blank: Aside from the Gimmies what music projects are you currently working on? Joey Cape: I am all-in on a new digital only label I started. It’s called One Week Records. We do 10 song records in 7 days at my home studio in San Francisco. We will release them as an event exclusively at http://www.oneweekrecords.com. It’s sort of like a BBC Session. I have people coming from all over the world to record here throughout the year. They stay at my house. They are my house guest with more than just a social purpose. It is so fun. I have completed 3 so far, all of which have a really great vibe. Not over-produced like so many other records by singer-songwriters. Very natural and, dare I say it: organic. Haha. I think this is going to keep me very busy in the coming years. After about 2 years of preparing, we launched on April 29th. I’m really proud of it. Words by Graham Isador on July 27, 2014, 4:13 p.m.
Posted by Graham Isador on July 27, 2014, 4:13 p.m.
Posted Feb. 9, 2017, 8:26 a.m.
Posted April 11, 2014, 11:02 a.m.
Posted Feb. 11, 2011, 8:42 a.m.
Posted June 19, 2014, 10:38 p.m.
Joey Cape (Lagwagon, Me First and the Gimme Gimmes) SPB: What is the most overdone cover song? Cape: "Brown Eyed Girl"